During Christmas break, four 22 year-olds from the possibly fictional city of Santa Teresa, California (though a section of San José does also bear that name) depart on a Mexican road trip seemingly bound for disaster (the expression “What could go wrong?” comes to mind). On their way down to Cabo San Lucas on the southern tip of Baja California, careening along in Bryan’s parents’ half-million-dollar RV as monstrous as a city bus, they run into criminals and prostitutes, gangsters and thieves, drunks, hustlers, visionary appearances in the sky, and a local curandero shaman. Each of the attractive four—two young men and two young women, two blonds and two brunettes—carries their share of burdens, but it’s a cute romantic comedy, so it all ends with everyone and everything unexpectedly redeemed by a series of miraculous cartoon-like events. Maybe they’ve learned a little something about life; or maybe they’ve just turned their magical experience to profitable advantage. “Montezuma’s revenge” is nowhere in sight. Everyone has their own agenda: The much put-upon nerdy Bryan (Jake Thomas) just wants to please his über-bourgeois parents by driving the Colossus down to Cabo by New Year’s Day so they can drive it back, and maybe get a little loco in Mexico to loosen up (and get laid). His friend Todd (Chris Brochu) has just about run out his trust fund and is looking for a little adventure (and to get laid). Todd persuades their two friends to travel with them: Lisa Bolanos (Arienne Mandi), a Latina obsessed with the late Mexican diva Lorena de los Ríos and suffering at home with a demanding sickly mother. Lisa wants to see if she can track down her absent father (José Zúñiga) in Baja. And there’s Jessica (Michelle DeShon) a filmmaking student with an assignment to come up with an extraordinary film short over the school break, who figures the whales off of Baja would make an exciting project. 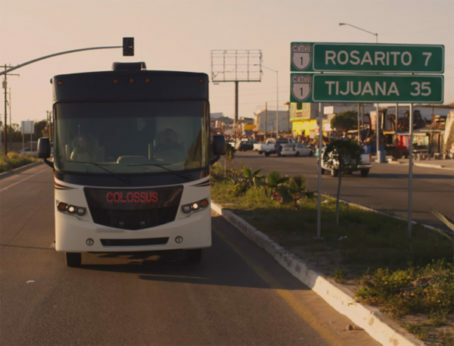 Once they cross the border, they run into the Cervantes-reading prostitute Carmen (Zoe Corraface), the suave guapo (that means “handsomísimo) gangster Jorge (Andres Londono) and his shabby drunkard American ex-pat sub-agent Burnout (Jason Spisak), and the road comedy is off and rolling. (We never see them doing anything so mundane as gassing up the RV, however.) Mark Margolis plays the curandero spiritual healer role of Don Primo. “I want the audience to smile and laugh a lot while viewing Baja. To me, laughter is healing. I want the audience to nod in recognition as they recognize themselves in the characters, and share in their journey. 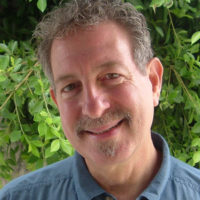 Jorge Roman, one of the leading directors of photography in Mexico with over 150 movie credits over the past twenty years, worked on this film. The Baja scenery is indeed a spectacular contrast of clean ocean water against dry, mountainous desert land. Viewers who can’t get enough of such panoramas will enjoy a vicarious revisit in Baja. Indeed, the cinematography may be one of the most successful elements of the film. But do not expect to see many real Mexicans, and certainly not their issues, problems or concerns. Baja offers a Mexico strictly for tourists. It’s far more telling about North American values of waste and excess, symbolized by the way-over-the-top Colossus and its owners. Even the score, by Music Supervisor Greg Landau, who specializes in producing Latin music, and his composer nephew Camilo Landau, is a picture postcard soundtrack. The film goes out with a song called “I Love You More Than Tacos.” How much more need be said? If Taco Bell is your idea of dining (and it is for some), you’ll likely enjoy this movie tremendously. If your tastes are more refined, you’ll find Baja mildly amusing as a date movie but forgettable. The trailer can be viewed here. Baja starts screening in theaters April 13th.